OPA is an all-volunteer run organization. Open positions are listed here. 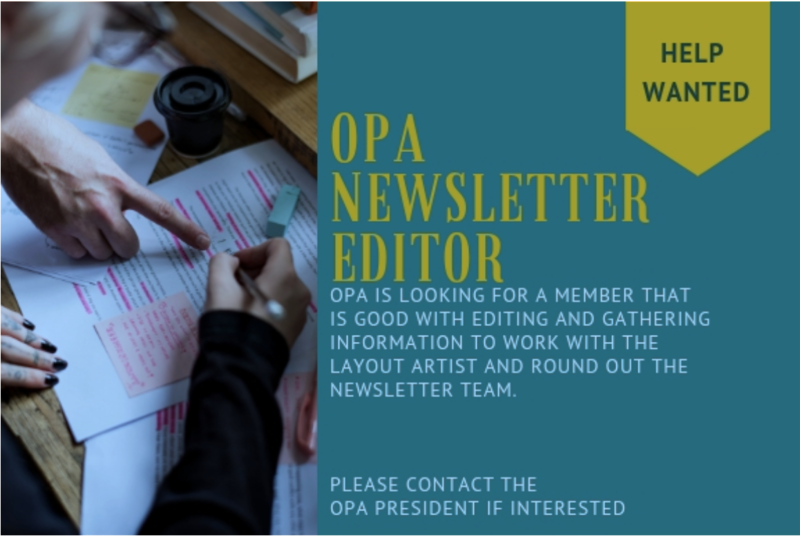 If you would like to sign up for a position, or learn more, email president@oregonpotters.org or any of the other contacts in each description. Your involvement makes OPA great! Because board positions are voted on, they are listed here even if someone currently holds a position and may re-run. Board positions (except for Vice-President, Treasurer and Ceramic Showcase chair) all hold a one year term, but may be voted in continuously. Program Coordinator positions are not voted on, and are filled by volunteering! Contact us today and get involved! Possibly our most treasured position! Ceramic Showcase and OPA functions can’t happen without you! Must have previous experience with quick-books. Manages memberships for the organization. Must be comfortable with databases and spreadsheets. We will train you how to use web-software. Organization and computer skills necessary. Attend board meetings and general meetings. Make executive decisions! • Include price for registration, member or non-member,various limits etc. We will help you learn web-software! The Vice-President reports directly to the President and is responsible for: overall program management oversight, planning and evaluation, fundraising, resource development, external communications, budgeting, personnel management, program expansion, etc. Get involved, make a difference! Share your bold visions for OPA. Edit the manual! Work from home, work with coordinators to ensure everyone knows what to do when they take on a new job! Empty Bowls chair or co-chairs needed! Please consider getting involved in thischaritable, community-visible, long-running program. Gather and post photos to go along with most posts. We will train you how to use web-software! Help promote and curate discussions on our website forums. Send out and help OPA leaders send out communications to our membership using the Web Software (Wild Apricot) System. If you are interested in helping plan exhibits and sales events, join us! We need your help! Ceramic Showcase Vice-Chair or co-chairs Needed! Create email templates using the new OPA design standard. Receive and process applications from resident artists, find requests and possibilities, help plan residencies. Make contracts with participating partners, go through checklists and support artists, follow through with payment and evaluations, manage budget. set up and take-down exhibits, help coordinate future exhibits.